As a wise hurricane guide once said, winter is a great time to think about hurricane season. Two major issues were highlighted during our last Irma encounter. Not being able to see out back was maddening, and I had no shutter plans for my garage window. The window to my garage has a big honking AC unit in it for the summer. The thing is too big and heavy to move when hurricanes come, so I need a custom shutter. I wanted it to be made out of a single sheet of plywood, but the threaded studs are 4 feet apart at the outside edge. I could have shifted the whole thing over, but instead I cut the sheet in half and did it in pieces. It makes for an easier installation. I used 3/4″ plywood which ended up being too thick, I couldn’t get enough purchase with the wing nuts. I used a forstner bit to relieve the area enough for the nuts to hold. Two cleats above the AC help stiffen the part and give a resting point for a center patch that ties the two halves together. Everything got a coat of primer to make sure they stay in good shape while waiting out in the garage. I reassembled everything to make 100% sure it all fit, and marked up some basic instructions. On to the back porch. I found polycarbonate panels that are similar to the metal ones we already have. They don’t come in the right sizes, but with careful sawing they can be made shorter. A center punch and 1/2″ drill bit put holes where you need them. They aren’t as easy to see through as normal windows, but at least some light can get in and you could tell if the shed is still there or not. Our back kitchen window has a full complement of clear shutters, and each back set of french doors has a single clear panel. Living in the land of sunshine can have its downsides. One is the summers here. It is still super hot here, though I think we are done with the 90+ degree days for the year. The other issue is hurricanes. 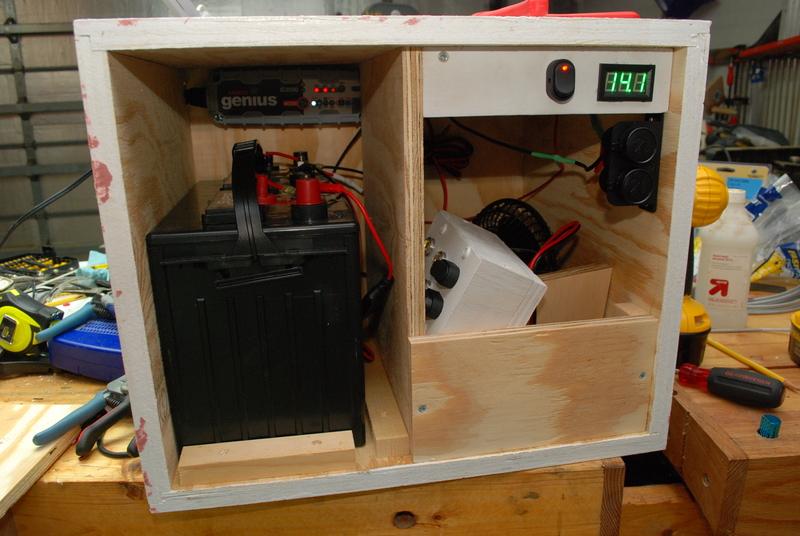 I had a loose setup of batteries on an ups to provide 12V power for charging phones and whatnot. It was kind of a mess and the batteries were pretty well shot. Our most recent hurricane scare pushed me into action. I wanted something more compact and organized with greater capability than my first setup had. I am making two boxes to use as general sturdy hurricane supply storage. A third box will house a deep cycle battery and have some tricks up its sleeve. Everything is made out of either 1/2 or 3/4 inch plywood. These all got assembled and painted at the same time I was building my bee cabinet. Once the painting was complete I started assembling the battery box. First I used cleats to kind of clamp in the battery a bit. It can still move vertically, but I don’t ever plan on flipping the box over. The charger goes in the back, with its cord coming out the side of the box. A divider keeps most things away from the battery and allows for some storage space. Next came a terminal block screwed to the roof, and a switchable panel voltage meter. This will let me monitor the voltage during charging and operation. Next came some 12V car power sockets so I can plug in all my accessories when I need them. Finally I stuck some black plastic HDPE over the terminal block to keep anything from accidentally shorting. Once I had that all wired up and tested out I put in a front divider to make the lower right area a storage bin of sorts. It holds a 12V fan, inverter, USB phone charger, and a special LED light box. Speaking of light box, here it is. I found some bright LED car lights that run directly from 12V. They got installed in a custom box with switches and a 12V car plug. Now I can plug these in and use either 2 or 4 lights to help light up a room during a power outage. With all the innards assembled I put hinged doors on all the boxes and some beefy folding handles. The battery box got a locking mechanism to keep the doors closed. The battery box is really heavy. To help with hauling around the house I screwed it to a small fold up hand truck. This means that just about anyone can move it around the house without causing a hernia. The two storage boxes are about 14 per side on the inside. The size worked out pretty well. One holds a pile of expandable 5 gallon water containers. I figure instead of trying to buy water ahead of each storm or season, I can just bottle it myself right before a storm hits. The other box carries a wide variety of odds and ends including solar cells and a charging circuit to charge the deep cycle up, candles, matches, other fire starters, soap and disposable bowls/utensils, playing cards, a weather radio, lantern, and other odds and ends worth keeping around. Now that I have gone to all this trouble and expense to be really prepared, we probably wont have the power go out for many years. Wouldn’t that be nice!